ZANZIBAR : All poultry imports banned. Sorry, not as much GOOD News as I thought there was going to be. But the BAD News headline alone was far too alarming, and hopefully unnecessarily so. The above stories are a major round up from the past few weeks of bird flu related stories. It was compiled this way to give an indication of the monumental spread of the virus across the planet, a perspective not readily clear in daily updates of new outbreaks in different countries. A listing of countries infected, as above, are few and far between in the media. The above stories have been listed in date order of the stories' appearances in the world's media, starting with the most recent stories at the top of the page. Late last year, the World Health Organisation predicted a human pandemic of avian influenza could kill more than 140 million people. Two weeks back, an acclaimed virologist told ABC News in the US that a human pandemic could kill half the world's population, 2.5 billion people. Another week, another estimate. This time....well, hardly any at all. "Scientists have discovered why the H5N1 avian flu that is so lethal in birds has not spread easily among humans. "Unlike flu viruses that are passed easily between people, H5N1 has a hard time attaching to cells in the nose, throat and upper airways. However, it readily attaches to cells deep in the lungs. "This suggests that people need close and heavy exposure to the H5N1 virus for it to get into the lungs, where it can take hold. But once there, it causes extensive damage to the machinery of respiration - the cells and air spaces where oxygen is exchanged for carbon dioxide. "'For the viruses to be transmitted efficiently, they have to multiply in the upper portion of the respiratory system so that they can be transmitted by coughing and sneezing,' said Yoshihiro Kawaoka, a virologist at the University of Wisconsin-Madison, who led the research team. "People infected with the virus, which has spread from Asia to Europe, the Middle East and Africa, have had close contact with diseased birds. Scientists fear the virus could mutate into a pandemic strain that could become highly infectious and capable of killing many millions of people. "'Our findings provide a rational explanation for why H5N1 viruses rarely infect and spread from human to human, although they can replicate efficiently in the lungs,' Dr Kawaoka and his team said in a report in the journal Nature. "Dr Kawaoka and researchers in Japan infected human tissue with bird flu viruses. Their findings suggest that strains of H5N1 circulating in birds would have to undergo several key genetic changes to become easily transmissible in humans." But those genetic changes haven't yet occurred, though there is still plenty of people who claim this could happen any day. The more we learn about the human form of avian influenza, the more it seems the panic may be completely unnecessary. It's a dangerous virus, no doubt at all, but the rush to scare the living Christ out of people, and to spend billions of dollars on anti-virals, has become a shameful exercise and, more than likely, a terrible waste of money that could have been better spent trying to save the lives of people who are already dying from infectious diseases the world over. Millions and millions of people each year. "Right now, there are 105,000 ventilators, and even during a regular flu season, about 100,000 are in use. In a worst-case human pandemic, according to the national preparedness plan issued by President Bush in November, the country would need as many as 742,500. "To some experts, the ventilator shortage (a machine to pump oxygen into the lungs) is the most glaring example of the country's lack of readiness for a pandemic. "Families are going to be told, 'We have to take your loved one off the ventilator even though, if we could keep him on it for a week, he might be fine....How do you think that's going to go over? It's going to be a nightmare.'" Russian scientists are now warning there remains only a few steps of mutation before the H5N1 becomes infectious in humans. In Russia, in the space of only one month, more than 800,000 birds have been slaughtered to stop the spread of bird flu amongst poultry stocks in the southern regions of the country. President Vladimir Putin has called for the establishment of a bird flu crisis centre following reports of three new outbreaks. Russia claims it has developed two new vaccines that should prove effective against the H5N1 bird flu strain, with the government set to buy some 100 million doses from domestic producers. Russian scientists now say it is only a matter of time before the virus mutates further and begins to infect and spread amongst human populations. Go here for a report from The Hindu. In China, a man hired by the government takes to the streets to spread the word on bird flu prevention. 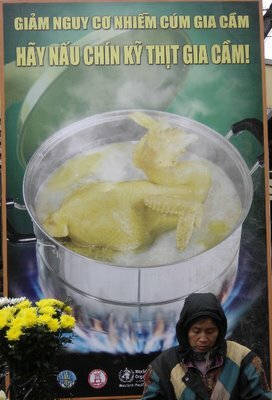 The above poster is popping up in Hanoi, Vietnam, warning that chicken meat is only safe when it is boiled to all buggery. Apparently the poster says that pink chicken meat is dangerous, and that advice is now coming from World Health Organisation as well. 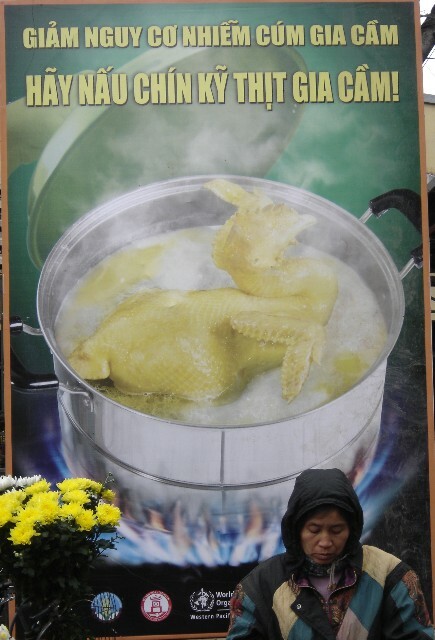 How long does it take to boil chicken until it turns yellow? A good half hour, apparently.